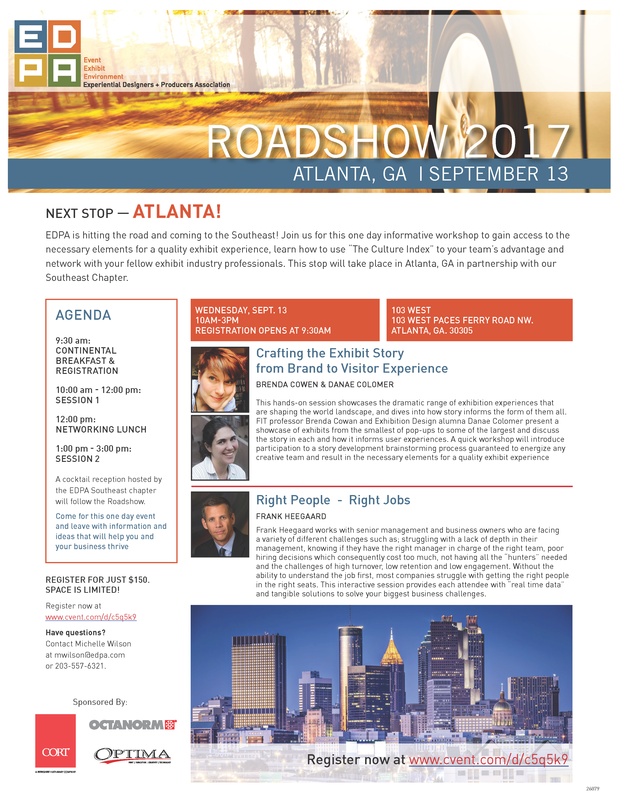 [November 7] - EDPA is hitting the road and came to the Southeast! It was a successful one day informative workshop that gained attendees access to the necessary elements for a quality exhibit experience, learn how to use “The Culture Index” to their team’s advantage and network with our fellow experiential, event and exhibit industry professionals.This stop took place in Atlanta, GA in partnership with our Southeast Chapter. [November 3] - Our last social of the year was successful! With family and friends out networking made for an eventful hockey game. 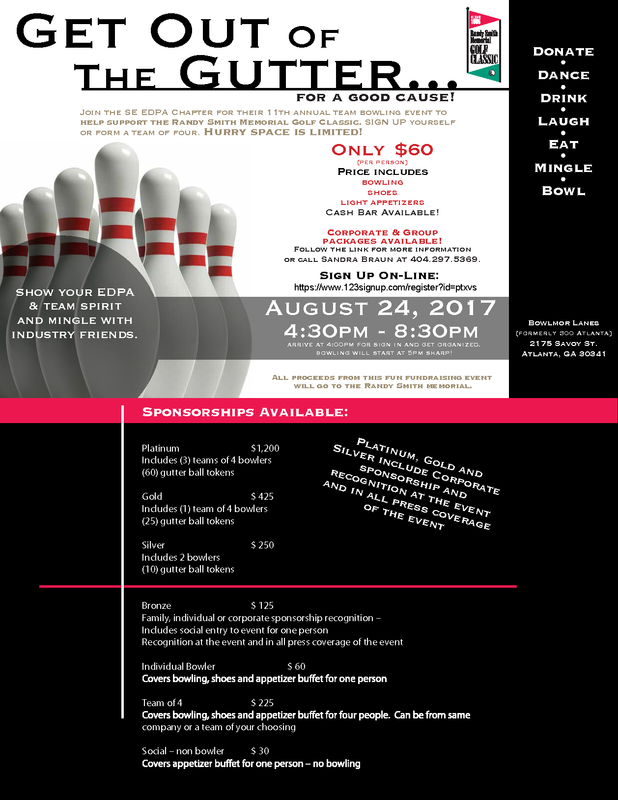 The Southeast Chapter of the EDPA sponsored the 11th Annual “Get Out Of The Gutter…For A Good Cause” charity bowling competition and social event on August 24, 2017 at Bowlmor Lanes in Dunwoody, Georgia. This year’s event was attended by well over 225 EDPA Members and was generously supported by key Corporate Sponsors raising much needed financial support for the families supported by the RSMGC. This group of bowlers was the largest group ever for this key SE Chapter event. [July 18, 2017] - Grab your friends and family and join us for a night out at the new SunTrust Park for a thrilling ball game. We have a problem. Electronic conversations are eroding our face-to-face conversational skills. Millennial's spend much of their time looking down at their phones texting, making them feel very uncomfortable with any type of face-to-face interaction. What does this mean for the future of the tradeshow industry? What does that mean for the tradeshow exhibits that have traditionally been spaces where meaningful face-to-face conversation leads to lasting connections? Engaging this audience is going to be harder than ever. Dr. Sachel Josefson proposes in this discussion that more than ever, we need to create tradeshow exhibit experiences that are more like science centers than marketplaces. We must use technology to help tell the story and facilitate meaningful experiences, rather than using technology for the sake of technology. Dr. Josefson explored the tradeshow exhibit phenomenon while completing his Ph.D. research. 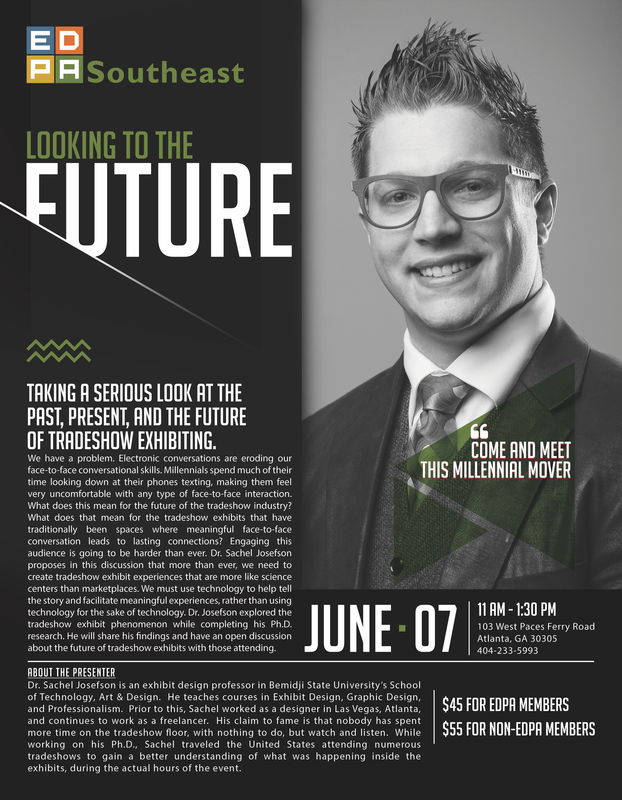 He will share his findings and have an open discussion about the future of tradeshow exhibits with those attending. •A secret technique that will make you a great communicator! The Southeast EDPA Chapter would like to extend a heartfelt thank you to everyone who supported The 2017 SEEDPA Shoebox Project, supporting the Greater Atlanta United Way! Boxes will distributed to women in need on Mother’s Day. Some boxes will be set aside and given as a welcome gift to men, women and children as they enter various shelters and programs throughout Atlanta this year. Your caring, generosity, and valuable time are very much appreciated. Our industry can always be counted on to support those in need. Today is Southeast EDPA's first Social Networking Event of the year! This is a FREE social that will take place at Gordon Biersch in Buckhead. The Southeast EDPA Chapter will provide light appetizers and a cash bar. Attendees will be able to network, play pool, and relax after a long day at work! Mark your calendars for our November Social, coming up in just two weeks! This is a FREE social that will take place at The Ivy in Buckhead. The Southeast EDPA Chapter will provide light appetizers and a cash bar. Attendees will be able to network, play bocce ball, human size jenga and relax after a long day at work!